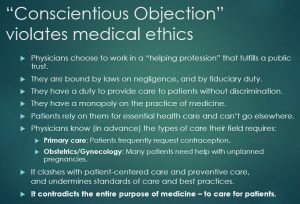 This website brings together views, news, and studies on the phenomenon of so-called “conscientious objection” (“CO”) in healthcare, in particular for abortion and other reproductive healthcare. Materials on this website support the “incompatibility thesis”, i.e., that the refusal to treat under CO is incompatible with the obligation to provide healthcare. 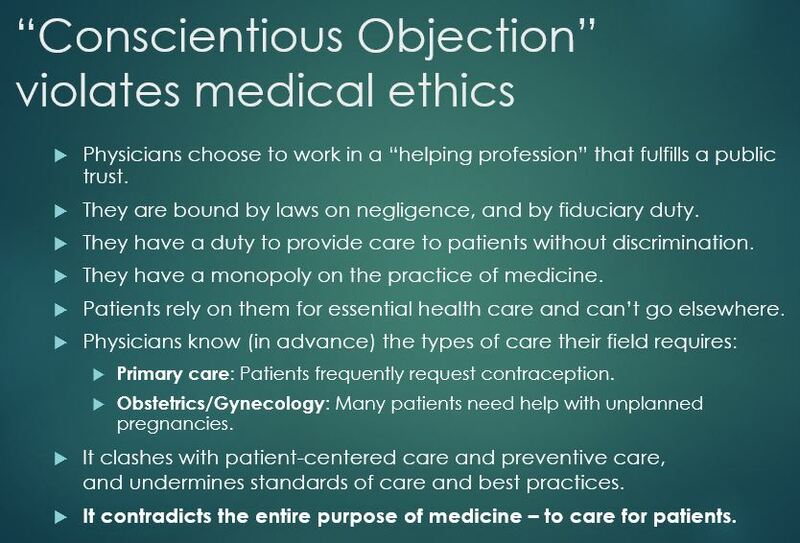 The refusal to treat under “conscientious objection” (CO) creates a fundamental contradiction and injustice. It is not about protecting the right to conscience because it has nothing in common with military conscientious objection, where objectors must justify their stance, are often required to undergo a rigorous review process, and face consequences. In contrast, healthcare professionals usually face no obligation to justify their refusals, rarely face any disciplinary measures, retain their positions and salaries, and even have their objection protected by law and policy. Physicians have a monopoly on the practice of medicine and they voluntarily entered a profession that fulfills a public trust. They know they have obligations to provide care to patients without discrimination, and that patients are completely reliant on them for essential health care and can’t go elsewhere. These factors make treatment refusals under CO a violation of medical ethics and an abuse of doctors’ position of trust and authority. It is discrimination because it mostly affects women, as well as increasingly the LGBTQ community, and the aged/disabled who need medical assistance in dying. A just society and an evidence-based medical system should deem the refusal to treat under CO as “dishonourable disobedience,” an ethical breach that should be handled in the same way as any other professional negligence or malpractice. Unless workers are able to adopt an attitude of professional distance that would allow them to deliver necessary healthcare with which they personally disagree, they should quit the field of reproductive healthcare, or not get involved in it at all. In fact, those two options represent the only honest exercise of CO in medicine. This website is operated by the Initiative for Reproductive Health Information (IRHI) and is a collaboration between Dr. Christian Fiala of Gynmed Clinic in Austria, and Joyce Arthur of the Abortion Rights Coalition of Canada. Victims of “CO” is a key feature of the website. Here we describe dozens of stories of women who suffered serious injustice or injury, including death, because doctors exercised their “conscience” and denied them abortions. Publications by Others provide summaries and links to articles by other researchers who generally share our views on the unacceptability of the refusal to treat in healthcare. * So-called “conscientious objection” in healthcare should be distinguished from “conscientious commitment”, which we define as the provision of necessary or beneficial health care to patients in need despite stigma, unjust laws, or oppressive systems. The exercise of “CO” denies care that the patient has requested, while conscientious commitment provides it. In other words, conscientious commitment upholds medical ethics and the rights of patients, while “CO” violates these fundamental values. A variant of conscientious commitment that also upholds medical ethics and the rights of patients would be the refusal to provide harmful or morally questionable “treatments” without genuine patient consent, including torture, executions, infant circumcision, or other non-beneficent care (for example, a risky experimental treatment or unnecessary amputation).